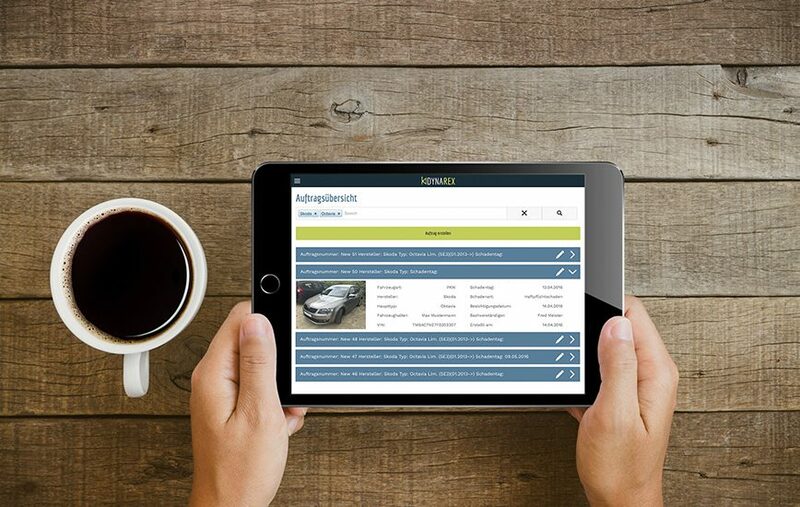 In times of rapidly advancing digitalization, in which end users in particular expect services via the Internet, the platform DYNAREX is an vehicle appraiser software solution for new business models and future perspectives. In addition to the classical recording systems PC and notebook, the new software solution DYNAREX makes it easy to you to integrate the tablet and smartphone into the process. You work across devices and start on the road on the smartphone. Find out about the next place of inspection, which was sent to you by the office. Once you arrive at the destination, start with the vehicle identification, take photos or dictate a damage description. Then pull your tablet out of the bag and take the parts with the graphic damage capture. If you do not have an Internet connection, you can simply work offline. Back in the office, you can final the assessment report on the desktop computer. However you want to work, it is easy in any case. We are forging new paths – including in the case of the licensing model. We offer a suitable module package for every size of company. DYNAREX plus:The module for text modules, expert reports and other documents. DYNAREX anywhere:The module for mobile damage recording even without an internet connection. DYNAREX invoice:The module for accounting systems, schedules of fees and collective invoices. DYNAREX payment:The module for open item management with inpayment and dunning system. DYNAREX stats:The module for statistics and reports. DYNAREX org:The module for process management using workflows, the standard QA inspection and the cooperative network. Recording mark-ups and mark-downs, as well as necessary repair costs, etc. No duplicate data collection necessary. Data for the adjustment is already recorded in the system. Free selection of vehicles, the “Replacement value corridor” document and structured result data are stored in the process. The user can work on as many devices as desired, without restriction. Text modules can be put together to make text module combinations. The collection of text modules recommended by the BVSK (FederalAssociation of freelance and independent automotiveappraisers) is, if need be, included in the scope of delivery for BVSK members. Text modules are linked to order, address, vehicle and result data via the field function. Text modules can be inserted from the key data in the expert report or in other written communications and changed there. other standard layouts (letters, declaration of assignment, repair shop information) are included in scope of delivery. After the office address and company logo have been recorded, standard layouts can be used right away. If need be, individual layouts are created in accordance with customer specifications. Other written communications can be processed before being printed. When there is an internet connection, the order is synchronised online again.